Independent Singapore and the People’s Republic of China (PRC) have a historically varied and complex relationship. The two states enjoy excellent economic ties, which have been a key feature of bilateral interactions since the PRC’s “Opening and Reform” initiative in the late 1970s. Substantial cultural, educational and tourist exchanges are also a feature of Singapore–PRC relations. Yet diplomatic ties have only recently reverted to a general cordiality after a protracted two-year period of friction. There have been other, longer periods of estrangement between Singapore and Beijing – Singapore discouraged its citizens from having contact with the PRC during the Cultural Revolution and established official ties with the PRC only in 1992. Singapore and the PRC are deeply economically intertwined. The PRC is Singapore’s largest trading partner, as well as being the largest of the other member states of the Association of Southeast Asian Nations (ASEAN). As a major international capital exporter, Singapore is the PRC’s second-largest source of foreign direct investment (FDI). Singaporean investments in the PRC include major government-linked development projects in Suzhou, Tianjin and Chengdu, in addition to regular commercial interests. Globalized production and capital networks mean that the Singaporean and Chinese economies also connect through other economies in the region and beyond. What must be noted, however, is the diversification of Singapore’s economy: ASEAN, the United States, Europe and Japan remain substantial trading partners for Singapore. Moreover, the United States, Europe and Japan are still larger investors in Singapore than the PRC in terms of both FDI and capital stock. Even if some proportion of trade and investment tilts more favourably towards the PRC, especially as Beijing’s Belt and Road Initiative (BRI) gets underway, Singapore is likely to continue to seek economic options beyond the PRC. These relationships provide Singapore with some buffer against overdependence on the PRC. The BRI obviously presents opportunities for Singapore. Indeed, Singapore was one of the earliest members of the Asian Infrastructure Investment Bank (AIIB), which is associated with the project. To the extent that infrastructure development promotes growth in Singapore’s immediate neighbourhood, this could raise demand for Singaporean goods and services. Prosperous neighbours are likely to be more invested in regional security. 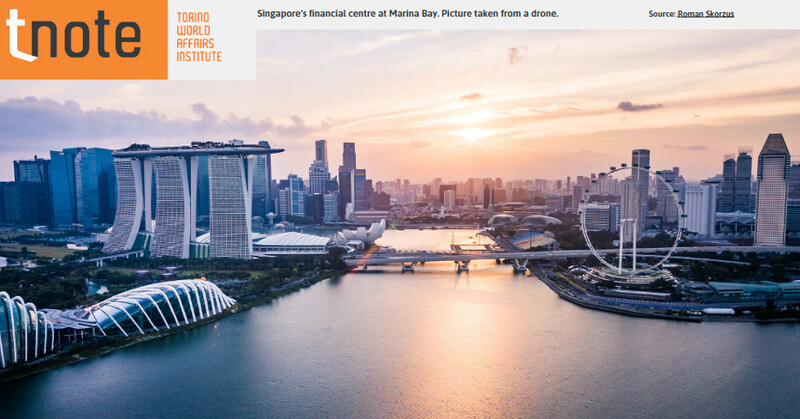 Of course, Hong Kong is likely to offer competition to Singapore, particularly in terms of financial and finance-related services. Moreover, Singapore’s economy has been diversifying away from maritime services — they now account for only about 7 percent of GDP. This mitigates some of the pressure resulting from enhancements in regional transport infrastructure. Externalities that could result from the BRI may be cause for greater concern. Economic benefits from the initiative that flow to various business and political elites in Southeast Asia may make the establishment of consensus more difficult among ASEAN members, particularly over issues that Beijing deems sensitive. Limited transparency and unclear corporate governance in the BRI projects may encourage rent-seeking and abuse, as well as distributions of costs and benefits that foster political instability. Furthermore, uncertainty over dispute management stemming from investment projects introduces higher degrees of risk in such projects. “Win–win” approaches and “setting differences aside” are fine until problems that require urgent management or resolution emerge. Rules, procedures, norms, laws, processes, and their practice, especially as they pertain to strategic restraint by the powerful, are especially important to Singapore. This is an area of some divergence between Beijing and Singapore. Singapore tends to favour stronger, binding processes that guarantee a degree of even-handedness. An area where Singapore–PRC differences over rules and processes are especially noticeable is over the rule of law in the South China Sea. When the Philippines sought an interpretation from an arbitral tribunal over claims on maritime features in waters it disputes with Beijing, the PRC called the processes flawed, refused direct participation and rejected the ruling of the tribunal. Singapore, in comparison, stressed the importance of the legal process and the binding nature of its findings even though it is not a South China Sea claimant. Rather, Singapore felt that complying with such internationally established legal procedures offered a better means of handling differences, maintaining stability and protecting its interests. A similar distinction appears to divide Singapore and the PRC over the degree to which a South China Sea code of conduct should be binding. Such differences recently presented key points of contention and friction between the PRC and Singapore. More knotty for Singapore is, perhaps, the way ethnicity intersects with PRC nationalism. Given that Singapore’s population is 70 per cent ethnic Han Chinese, many PRC citizens and even officials believe that Singapore should be particularly understanding of, if not sympathetic to, PRC concerns. This includes issues such as the PRC’s various territorial disputes and suspicions of the United States and Japan. There is sometimes surprise, a sense of betrayal, and even anger from PRC official quarters when Singapore’s official position diverges from that of Beijing. Such perspectives come from a sense of Chinese nationalism that rests heavily on linking ethnicity to political loyalty to the PRC. Singapore and its Chinese citizens, however, do not and should not share the same sense of nationalism as in the PRC. Despite historical linkages between Chinese nationalist movements, ethnic Chinese in Singapore now have very different political loyalties. Even though Singaporean Chinese may speak languages and share cultural practices that originated from what is today the PRC, they are no more Chinese citizens than French-Canadians are French citizens. Singapore’s post-independence nation-building project continues to be about creating distinct Singapore citizens. Such a position is critical given the need to hold together Singapore’s multi-ethnic population and avoid characterisation as a potentially hostile Chinese “fifth column” by its neighbours. The PRC is one of Singapore’s most important foreign relationships. Much of this comes from the fact that the PRC is critical to prosperity and stability in Asia. Singapore’s future is in many ways tied to the PRC doing well. However, Singapore will continue to seek other partnerships, inside its region and out, for the simple reason that such diversification of ties is an effective risk management strategy. This means that Singapore has an incentive to continue engagement with Europe, Australia, India, Japan, the United States and others. Singapore also has a longstanding interest in binding international rules that it prefers major powers, including the PRC, to abide by. To the extent that Beijing accepts an open and inclusive Southeast Asia as well as established and binding rules, the Singapore–PRC relationship is likely to continue smoothly. That said, predictability and comfort in the Singapore–PRC relationship also depend on a continued commitment to the region by Singapore’s other international partners. The positive trajectory of Singapore’s current ties with the PRC rests on such conditions being sustained. If this situation changes, as may arguably be the case at present, Singapore’s relationship with the PRC may become more fraught and require some recalibration.